If you’re in the business of hosting content and moving bytes around, then it’s hard to have a conversation of any length without the word Netflix coming up—after all, they currently push a third of all the traffic on the Internet on a busy day, and they’re the gold standard for how to run cloud-based applications. While waiting backstage at Interop, I had a chance to chat with some of the people who build such things, and naturally, the conversation turned to the ubiquitous video streaming service. One of my favorite questions to terrorize traditional businesses into thinking about disruption is to ask them, why isn’t Blockbuster Netflix? After all, Blockbuster had everything—its customers, their payment information, their rental history, and even all the licenses for millions of movies. And yet Netflix completely trounced them. Backstage, this inevitably led to the question of who might one day trounce Netflix. Over on Read Write Web, John Paul Titlow thinks that Google has a big, secret advantage in the form of all the data it collects and mines, a post which Alex Bowyer pointed me at. I think Titlow is right, but not necessarily for the reasons he describes. Data is key, and could help guide what a broadcaster should produce. But while Google is good at data, Netflix is, too—it measures things like mouseovers, and how you linger over a movie. No, the real threat Google presents to Netflix comes about because the company can monetize content and engage audiences across the long tail of video, which is more than just guidance. It’s cold, hard cash. Tenner’s unexpected outcomes are everywhere today. SMS was invented to send urgent messages asking someone to call; fast-forward a decade or two, and SMS is a form of social interaction used specifically to avoid calling someone entirely. and the forms of interaction as well as payment that it can bring to different kinds of content. Netflix’s customers and users don’t produce content from which Netflix can make money. Google’s do, in the form of uploads. With Youtube’s paid channels and personal accounts, subscribers create targeted, long-tail content (the gluten-free cupcake baking channel, for example.) And Google lets them do so for zero incremental cost. When the cost of an experiment is zero, and the whole world can run them for you, amazing things happen. What Google has is an engine to find the next breakout success because its users roll the dice on its behalf. If gluten-free cupcake videos are a breakaway success, it’s easy for Google to monetize them by moving them to a cooking channel, for example. What’s more, every Android device is by default a screen with which Google can, in essence, run audience experiments with the content that their creators are uploading. Netflix might have an installed base on game consoles and devices, but it doesn’t own a smartphone operating system. When it comes time to monetize those things, Google has plenty of models (advertising, subscriptions, purchases, and rentals), each of which is suited to a particular kind of content or audience. Say you’re watching Arrested Development. Where do you go to chat about it? Elsewhere. When you watch a YouTube video, you can chat right there on the page. Yes, most Youtube comment threads are simply trolling and thick-headedness today; but they’re infinitely more interactive than a Netflix page. In the future, the user experience with which we consume content will shift. You’ll have the video on a TV on the wall, and you’ll be commenting on the tablet in your hands (which may also be your remote), logged into the same account. Google already has your preferences and permissions; Google+ might as well be your movie watching diary, across paid (Google Play), rented, ad-backed, and subscribed channels. You don’t even have to do anything—the long-game genius of Google+ is that it’s really the logfile of your digital life. It collects everything, and then you share it if you’re so inclined. In Larry Page’s always-on future, sharing is watching. This community-trumps-content battle has happened before. When Ben and I wrote Lean Analytics we talked to a number of founders and entrepreneurs, and one of the most interesting stories was that of reddit, the hugely popular social network. When reddit started it was merely a link sharing site like any other. You couldn’t comment, and you couldn’t self-post. But the founders quickly added commenting, then nested comments, then voting on the comments as well as the link. 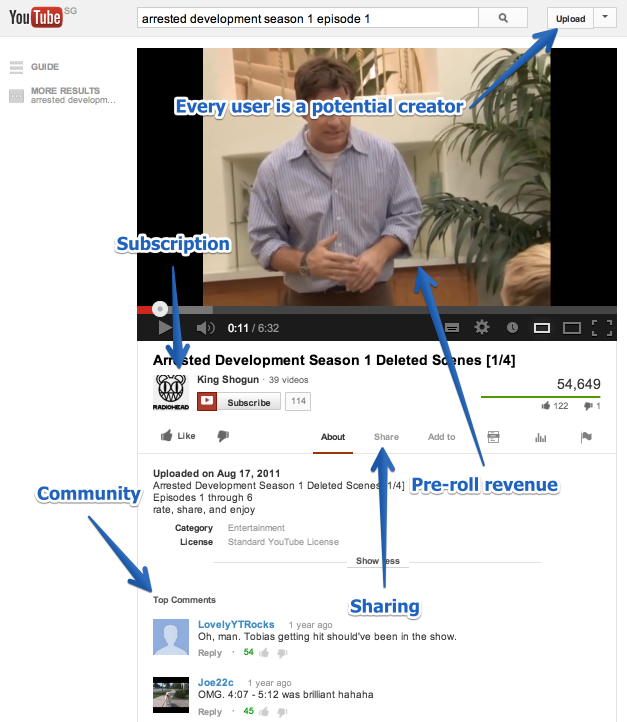 Other link-sharing sites that didn’t build a community have stagnated by comparison. reddit also allowed the creation of posts that didn’t point anywhere (self-posts), and today self-posts comprise roughly half of all new posts. And reddit also has a donation model (reddit gold) which has become a kind of in-site currency for approval, as well as a crowd-funded model for those who believe a site like reddit should exist. Content pundits often talk about the “long tail”—there are a few pieces of content that many people see, and many pieces of content few people see. This is also known as a “Pareto curve” or the 80/20 rule. And in the world of online video, the long tail of content extends out to every bad video ever made. I think the future of video is different monetization for different slices of the long tail (rent new blockbusters; buy classic films; subscribe to paid channels; watch ad-sponsored long tail.) Google has a machine for all these slices, and the Analytics and business model coverage (Play, Wallet, Adwords) to monetize all of them, and the ability to seamlessly move a content producer or breakaway success from one slice to another for zero incremental cost. Here’s how I think all of these play out. You can click the graphic for a bigger one; it’s a bit hard to read. The data is a means to an end, of course. It’s how Google knows what to move to which slice. But the ability to monetize all the slices of the long tail, and to provide community for each slice, is more zombie horde than Trojan Horse—and one that’s hiding in plain sight. 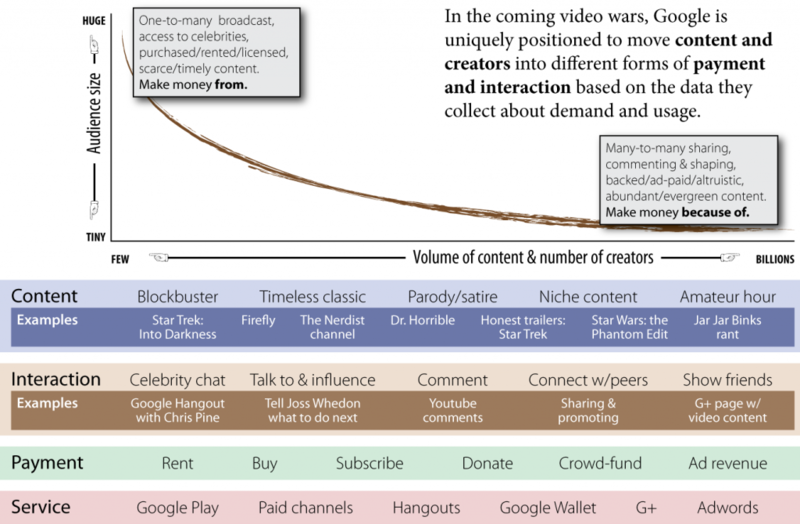 It’s not clear that the future of video is interactive and long-tailed. But it’s probably not the old model of television. For Netflix to avoid its own disruption, it needs to consider how it will slice up the long tail of content; get its user to become producers; and encourage audience interaction. The previous Star Trek, for sale or rental on Google Play. Honest Trailers: Star Trek on Youtube. The Nerdist channel on Youtube. Star Wars: the Phantom Edit (deleted scene of Jar Jar’s death.) The entirety of the Phantom Edit is actually over on Vimeo. Star Wars: Kill Jar Jar fan video on Youtube. Of course, all of those involve Google in one way or another, across the entire spectrum of video from blockbuster to nonsense. Success for Netflix depends on content, user experience, price, competition and quality. I don’t think it depends on their users becoming producers and interaction. I think the the differences between “lean back” and “lean forward” viewing has diminished in the past few years. However, I feel there may always be a difference between storytellers and listeners/viewers and those experiences. Gotye’s song has gone around the world, and now it’s come home to roost. Wally De Backer takes covers of his song and turns them into a symphony.